Barium carbonate powder is dense and white and is manufactured either from the mineral barite (BaSO4) or from barium chloride. Subsequently a precipitation process is used to get the carbonate form. There are several crystalline forms of BaCO3, alpha is the most stable. 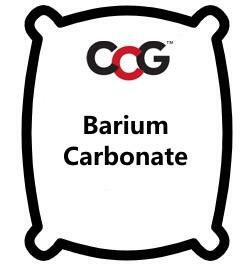 In art ceramics barium carbonate is popular for the production of classic barium crystal mattes, BaO readily forms crystalline phases during cooling. These are dependent on adequate kiln temperatures, cooling cycle and the chemistry of the host glaze (a slightly reducing atmosphere is also beneficial). Some have observed that in some formulations, barium crystallizes so well that it will occur even with very rapid cooling. Barium can act to initiate crystal development in other chemistries, for example metallic glazes can benefit by the addition of some barium carbonate.